Many have recently brought to my attention a recent viral video involving one of our affiliates, Bad Axe Throwing. For those unaware, there was a video posted on Instagram of a thrower who had an unlucky bounce. The throw was close to the target, bounced off the floor, and ricocheted off the footer, and back at the thrower. Thankfully you can see in the video that no-one was hurt, including the coach who was to the right of her. This is something worth taking note of. In my years of experience, and seeing many axes being thrown, it is rare I see something new, but this truly is a first. 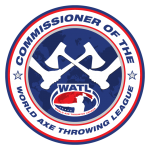 The World Axe Throwing League requires a high standard of safety practices and since becoming aware of the situation, I personally worked with Bad Axe Throwing management to investigate the video and ensure they continue to meet the highest of standards of safety to ensure a fun and safe environment for all their customers. After hours of reviewing the situation, interviewing people involved, and checking on all videos, including security footage, this really is a one-in-a-million throw. Our affiliate, Bad Axe Throwing, has had over 15 million axes thrown and has never seen anything like this before. Perhaps the most fortunate thing to come from this is that the video has sparked great debate on a great many aspects of axe throwing safety and if there is a way to make sure our sport continues to be safe. Many items have been discussed such as types of axes, the power of the throw, whether hitting the floor was intentional, etc… We’ve been able to rule out many as a primary cause, such as the axe handle material (as all axes handle materials can bounce when not thrown properly as seen here) and even though there were many small contributing factors we’ve been able to address what we believe to be the primary one. The combination of mats on the floors when paired with the type of axe used with a rubber handle. So after speaking to the Bad Axe Management, we’ve made sure to clear with them that all their locations will be removing the rubber mats from the floor and we will be recommending to all other WATL facilities do the same if they are using those as well. Bad Axe is moving towards removing all Estwing axes as their “house axes” for customers to help mitigate this from happening again. In this short time of existence for our beloved sport, we’ve worked very hard to maintain the best safety standards as possible. It’s safe to say that with all of our 150+ locations serving thousands of patrons every day, we’re estimating that we will approach over 35 million+ throws in the next year. But no matter how safe all of your practices are, there will always be a small amount of risk with activities like these and no sport is exempt from human error, even from professionals in sports. The most important thing we can do now is to take this as a learning and teaching experience for the future of the sport and activity.